I have long been searching for the first home of the Wangaratta Fire Brigade. There was much fanfare over the opening of the purpose-built building in Ford Street in January 1896 (see my post here), but no clues were given as to where the brigade was located before that date. Newspapers, maps and books all drew a blank but the answer had been right underneath my nose for a few years. I had located a hand drawn map of Wangaratta’s central business district at the National Library of Australia. 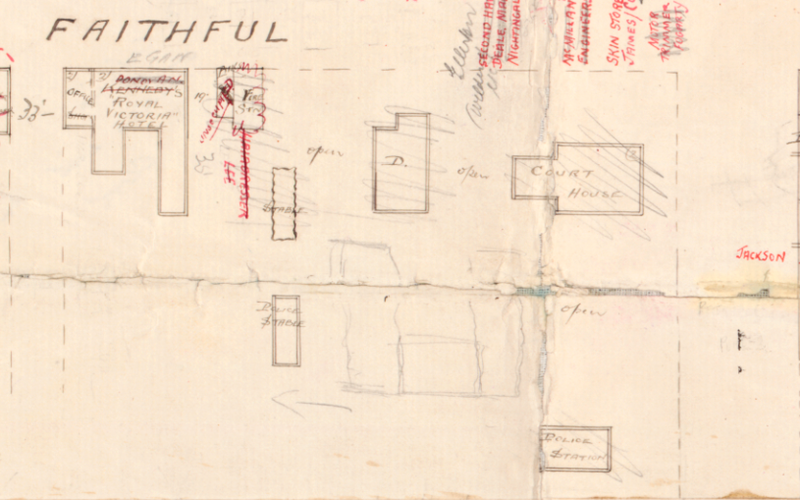 It is a messy and complex document outlining each building in the main streets, along with notations as to what the building was constructed of, and how many stories it was. Recorded on each building is the type of business and the operator of that business. Notes on this map suggest that an “old map” was destroyed in 1900 and that this map was begun anew in 1904, with many of the pre 1900 notations carried over to this new document. The map was revised fourteen times between 1904 and 1937. Many alterations were made as buildings were added, burnt down or extended, and tenants changed. On some sections the changes over time can be followed as different ink was used or a different hand made the new entries, but in some cases the map became so messy that paper was glued over the old notations. For these reasons the map is quite difficult to read and the annotations difficult to date and sometimes understand. 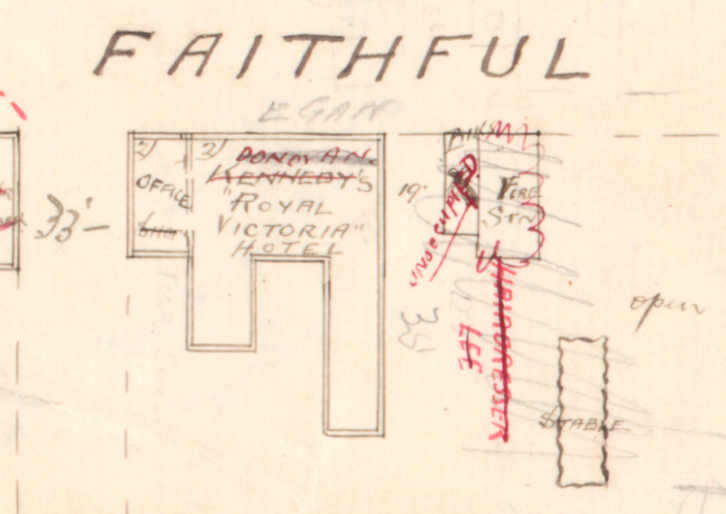 Despite the difficulty in reading the document it can be seen that the old fire station was located in Faithfull Street just to the east of the Royal Victoria Hotel. It was a small timber building, indicated by the single outline. The stables at the rear were constructed of corrugated iron. The Royal Victoria Hotel was brick as indicated by the double outline, and double storey as indicated by the bracketed 2) in the corner. In 1904 Thomas Edwin (known as Ted) Lee, a hairdresser, occupied the former fire station but by 1912 the building had been demolished. The 33 foot wide road on the west of the Royal Victoria Hotel was Chancery Lane, which was renamed Victoria Parade in early 1908. As seen in this post, the volunteer brigade was first created in 1872 but it barely got off the ground. When the formation of a brigade was first mooted in 1872, Councillor James H B Spearing ordered a fire truck to be built by coach builder and blacksmith Henry Sharland who had his business opposite the Horse and Jockey Hotel in Ryley Street. However when the account for £26 was presented to Council for payment there was an uproar as the brigade had no permanent home. Councillor Murdoch wished to know where the fire truck was, and where it was to be kept? Was it to be another white elephant? It required horses to pull it. No sane man would get a bedstead until he got a house to put it in. Where was the water? Cr DIXON said he passed the account because it had been recommended by a committee. Cr TONE moved, and Cr MURDOCH seconded, ” That Mr Sharland’s account be not paid at present.” Cr SPEARING said he had been authorised by the council to expend £30 for apparatus to extinguish fires. He would take it upon himself to raise an efficient fire brigade. They would likely save property amounting to some thousands by and bye. Cr BOYD thought it would be best to not pay the account presented by Mr Sharland until the council get possession of the fire truck. Perhaps after that fiasco the brigade disbanded, but in June 1876 it was resurrected, in part due to the installation of reticulated water the previous year. In May 1876 Alexander Tone chaired a meeting at the Council Club Hotel with the specific goal to form a brigade. John Grant moved that a brigade be formed and A Jones (probably Andrew Jones) seconded the motion. J Johnston (probably John ‘Buffalo’ Johnston) was nominated captain, with Charles Joseph Pruen as vice-captain. A committee consisting of nine men – Otto Martin, James Holmes, Thomas Swan, James Montgomery, George Brew, H. Jones, David Dewar, W. Walters and George Simcock was formed. The following week another meeting formalised the arrangements with the election of the nominated captain and vice-captain and the final committee of seven men consisting of John Pyke, R. R. Peel, David Dewar, Thomas Swan, James Holmes, Otto Martin and Mr Hegarty (probably James Martin Hegarty). Brigade members included, in addition to the seven committee members and captain and vice-captain, George Brew, Miles Foxcroft, Andrew Jones, James Montgomery, George Simcock, Mr Dyson (probably Joseph Dyson) and Messrs Garnett, Hoad, Scott, Sutton, Urie and Woodhead (possibly Joseph Barber Woodhead). The hunt was now on for premises to store the equipment. This article published in the Ovens & Murray Advertiser indicates that Otto Martin was involved in purchasing a fire bell, and businesses were touting their fire pumps to Council, suggesting that at last the Council were supportive of a brigade. However the Council was not forthcoming with a building for use by the brigade, and when the brigade took matters into their own hands, the Council was nowhere to be seen. As a result the brigade was unsuccessful in their bid to use the old telegraph office building on Murphy Street for a base. The Old Post-Office as a Fire Brigade Station. — The deputation, accompanied by Mr Hanna, proceeded to the post and telegraph department, and submitted an application for the use of the old post and telegraph office, at Wangaratta to be granted to the local fire brigade, but were at once referred to the Public Works Department, and on making the same application they were informed that, in order to have it entertained, the Council must offer to pay a nominal rent and undertake to keep the premises in repair. The deputation not having been instructed to do these things leave it to the Council to deal further with the matter. During the 1880s two brigades were in existence in Wangaratta, the Wangaratta Volunteer Fire Brigade and the Wangaratta Fire Brigade. I haven’t worked out which one was using the shed that is the feature of this post but the story of the two brigades is one for another time. For more on the Fire Brigade see Wangaratta Fire Brigade Centenary 1876-1976 by A.O. Smith.